Unofficial posters promoting Steve McQueen's much acclaimed film 12 Years a Slave appeared in Italy and created a wave of outrage. The reason of the row is that the posters highlight minor roles over key ones- just because the actors interpreting them are white and famous. 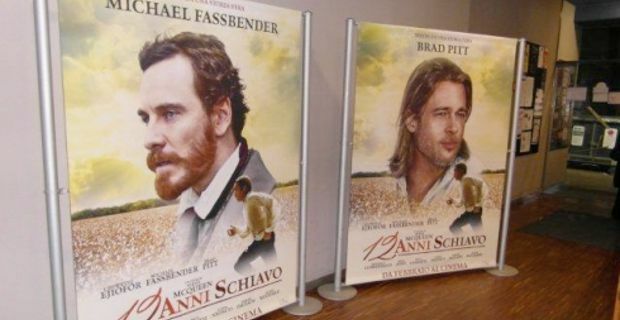 The unofficial Italian posters feature Michael Fassbender and Brad Pitt giving both of them prominence over the film's true leading man, British actor Chiwetel Ejiofor. It appears the Italian film distributor completely missed the point of the film, which tells the true story of Solomon Northup, a free black New Yorker captured by slavers in Washington DC in 1841 and sold into servitude on the plantations of Louisiana. Protagonist Northup is played by Ejiofor and has earned him so far a Golden Globe nomination. It is true that Fassbender has attracted strong notices too, but his is only a supporting role, that of a sadistic plantation owner, while Brad Pitt, who is a producer on the film, has only a minor role as a Canadian labourer. Elevating to prime position in publicity the two white co-stars of the film backfired heavily on the Italian distributors and marketing company. The posters, which appeared across Italy earlier this week, prompted a widespread criticism on social media, while Hollywood studio Lionsgate, acting through its Summit subsidiary, labelled them 'offending material' and 'rogue' and said it was doing its best to have them withdrawn. A spokesperson for Summit Entertainment told Variety: "The 12 Years a Slave theatrical posters featuring Brad Pitt and Michael Fassbender that were recently released in Italy were unauthorised and were not approved by any of the producers or licensors of the film. Summit Entertainment, acting as exclusive sales agent for the licensors, is investigating and taking immediate action to stop the distribution of any unauthorised posters and to have those posters currently in the marketplace recalled." Italian film distributor of Globe nominated 12 Years a Slave is reported to have apologised over the release of the unauthorised marketing material.